Why don't my cats sleep with me? Does that mean they don't love me? Believe it or not, lots of cats don't sleep with their people. I don't sleep with our human, but I love her a lot! We really do love our creature comforts, and I find my own bed much more comfortable than hers. And she's too restless. I take sleep very seriously, and I do not like being disturbed! I asked Muffitt and Sizzle about this because they sleep with our human every night. Sizzle said he likes her bed better than his because it's big, and he can really stretch out. Besides, he loves her, and he knows she sleeps better when he and Muffitt are with her. All cats need a job to do and a sense of purpose. Muffitt's and Sizzle's job is to make sure she gets enough rest. There are other reasons why cats sleep with their people, too. One is warmth. 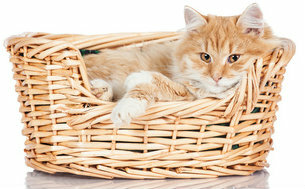 Sleeping next to a heat source (a person) helps a cat's body maintain its normal temperature without having to work too hard. That's probably why Boccelli sleeps on our human's head. That's the warmest part of her body. Another reason cats sleep with their people is safety. Nothing makes you feel more secure than sleeping with a huge human who will protect you from anything and everything. But that security thing can work both ways. At our house, the cats take shifts so our human is never alone. Katy and Honey take naps with her. Sizzle and Muffitt take over for the night. Muffitt loves sleeping against her chest. She comforts herself and our human, too, by licking her hand until one of them falls asleep. 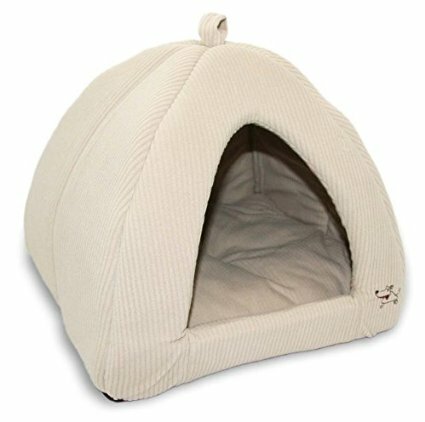 Could you give your cat a new bed of her own and put it on yours? She might like one of those round doughnut beds with very low sides . Sprinkle some catnip in it to make it more interesting. But don't carry her into your bedroom. Let her discover the bed on her own. Or see if she'll follow you and a bag of treats into your bedroom. Sit on the bed and open the bag. She'll probably jump up to get the treats and might cuddle with you after she's done eating. But don't be disappointed if your cat still doesn't sleep with you. All of us have our favorite spots for naps. Mine is the powder room sink! This is my favorite bed .